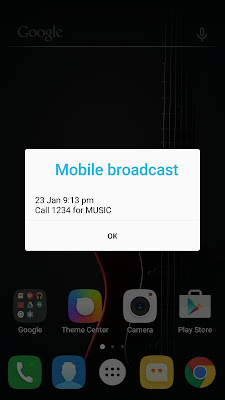 solution for cell broadcast mobile broadcast notification Lenovo k4 note VIBE (A7010a48). Hey K4 note users, I know how bad you guys are feeling. Because i did as much as well. The small bug in K4 note is annoying "mobile broadcast" or call broadcast, I was getting almost 20 to 30 notification that is simple advertisements from the cellphone operators per hour. The normal way of disabling in message setting is not working for this phone. So, I searched a lot and find out a perfect solution for that. Unlock the developer option by tapping build number of the phone. >> Settings > About phone > Device information >tap 5 times on "Build number". Now you can find the developer option in settings. Go to developer option and enable "USB debugging". Connect the USB to the PC, Let it install drivers (mine recognized automatically, If not worked for you find proper USB drivers). Run the Developer tool in PC, check weather device is recognized or not. If connected properly, click on "Read Device Packages", The software will read the list of bloatware and displays it. search for "CallBroadcastReceiver" in that list and tick that. Click apply, the software will debloat & remove that service. Now your phone is free from all call broadcast messages & irritative notifications.